Is it wrong that much of my historical knowledge base comes from the Mel Brooks movie History of The World Part 1? I mean isn’t that where everyone learned about the French Revolution and the Spanish Inquisition? And who could forget Madeline Kahn singing her way through the testing for eunuchs. I reference the movie often in my mind when I visit a museum, read anything about history or as in the case of this weekend, visit The Forbidden City in Beijing. 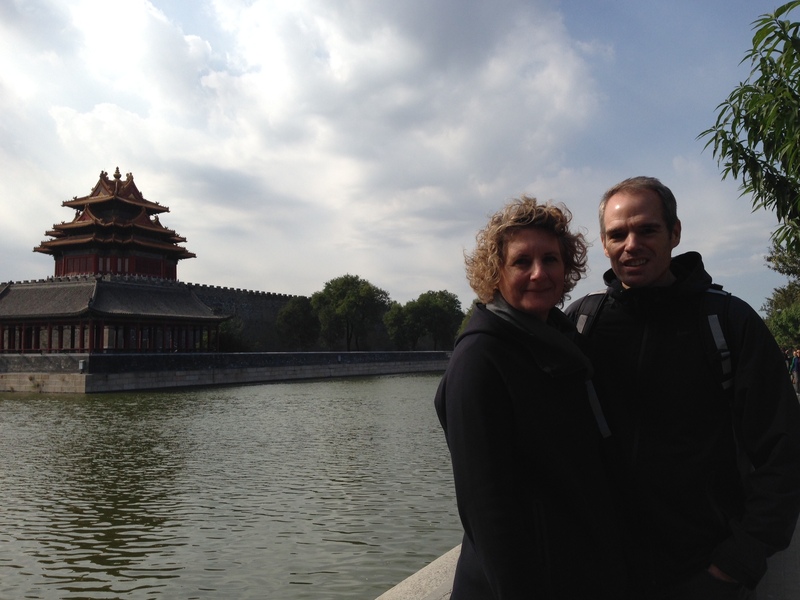 The Forbidden City is located in central Beijing. 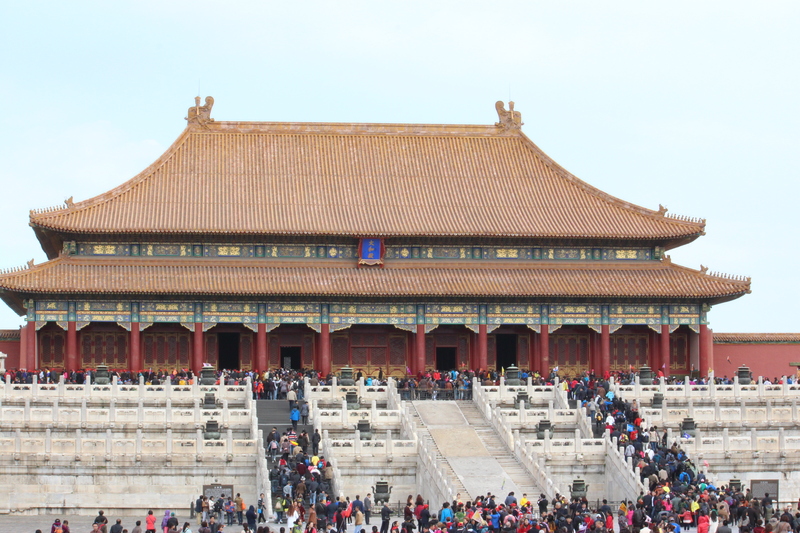 It was the Imperial Palace from the Ming Dynasty to the end of the Qing Dynasty. Forbidden as in no commoners were allowed inside the walls and no one was allowed in without the Emperor’s permission. Construction began in 1406 and took over 1 million workers 14 years to complete. The Emperor who oversaw the construction, must of thought very highly of himself as he demanded almost the impossible in every little detail. We learned through our guide Crystal, that this Emperor, Zhu Di, believed he was the earthly counterpart to the Celestial Emperor and that he demanded the best of everything but never to out do the heavenly abode of the Celestial Emperor. As an example, The heavenly palace is said to have 10,000 rooms, so Zhu Di had 9,999.5 rooms built within the walls of the Forbidden City. I couldn’t believe it as I was curious to the whereabouts of all these rooms. I tried not to roll my eyes when Crystal showed us what was considered a room. She had us look up at the ceiling to see the designed squares. Each square represented a “room.” Really? 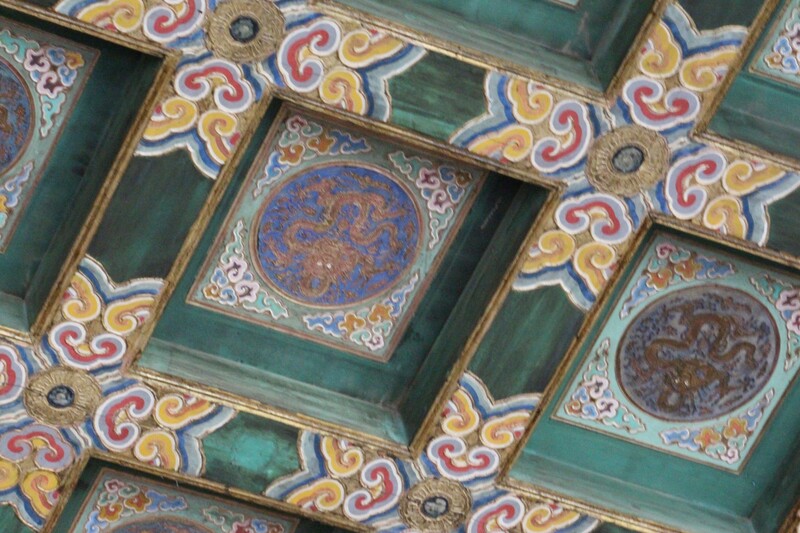 You might also recall from an early blog the symbolism of roof decorations. The number of statuettes or characters represents the status of a building. A minor building or a home outside the palace might have 3 to 5. The Hall of Supreme Harmony has 10 and was the only building in the country permitted to have that many. The Emperor also owned the color yellow. 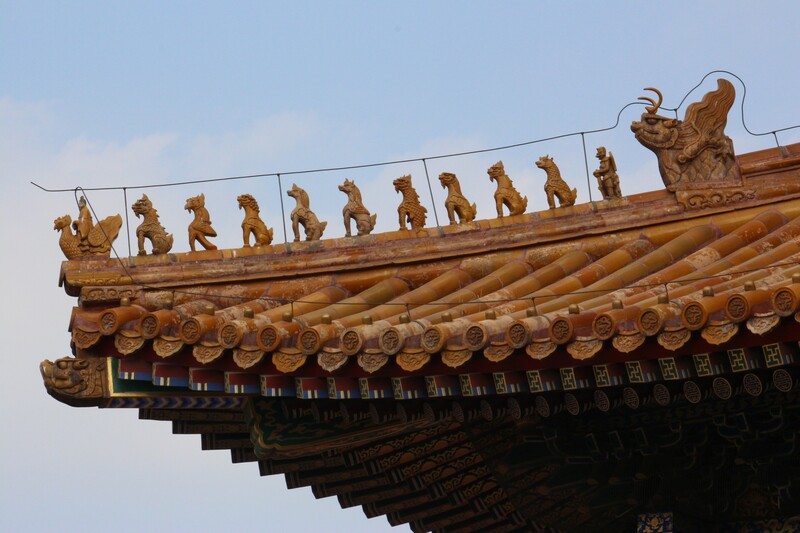 All the roofs in the Forbidden City are made of yellow tiles. All other buildings and homes were forbidden to use Yellow, the color of the Emperor. 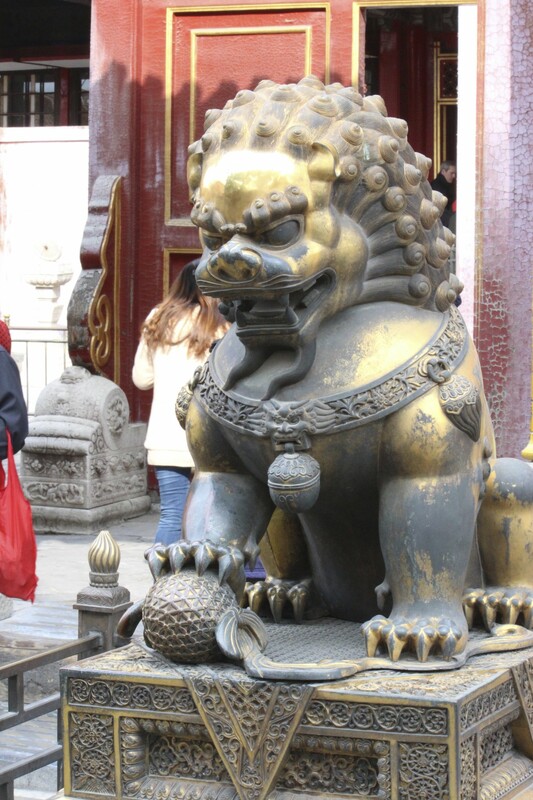 The design inspiration of The Forbidden City is heavily influenced by Feng Shui. Zhu Di wanted to include the five elements of metal, earth, fire, water and wood in the making of The Forbidden City. Metal and fire are present in the huge brass caldrons that are placed throughout the grounds to hold the water that the servants delivered. Fire was used under the caldrons to keep the water from freezing. Wood is used throughout in the buildings. Earth was a little trickier to represent so The Emperor had a mountain built north of the city. It was built from the dirt pulled while forming the moats that surround the city. Beijing is flat. There are no other “mountains” in the area but it was important to the Emperor and so it was built. According to Feng Shui it is favorable to have your residence to the south of a nearby hill. One more example of the Emperor’s power. He demanded to be carried up the stairs of the different halls he had built. But he couldn’t be carried over the same stairs that the servants used so huge slabs of marble were brought in from the countryside. The slabs were moved in during the winter so the servants could ice the “roads” at night and pull the slabs across the ice or roll them on stems of bamboo. 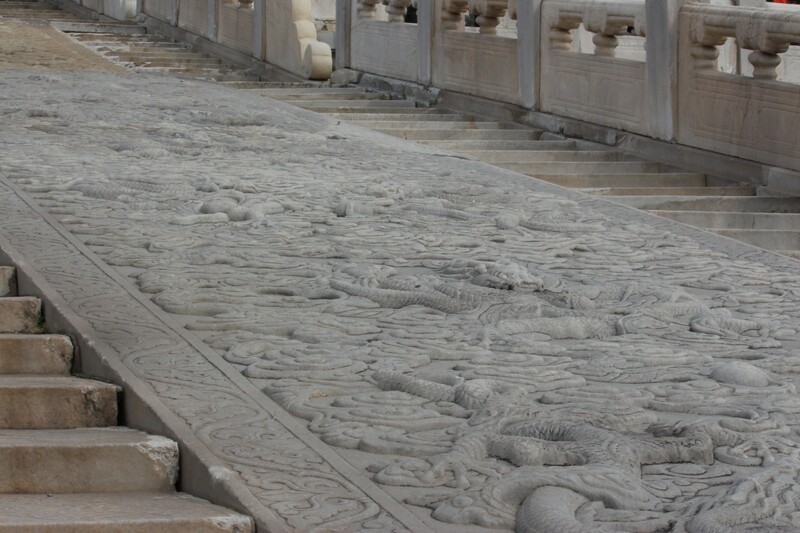 But a slab of marble wasn’t quite good enough so he had artists carve graphics into each slab. He was then carried over the beautifully carved slabs of marble while the servants walked on the stairs to each side. We walked through the courtyards leading from one hall to another and ended up at the far end of the city where the residence quarters were located. A huge area where we learned only the Emperor’s family lived. The Emperor was married and had many concubines and perhaps hundreds of children. 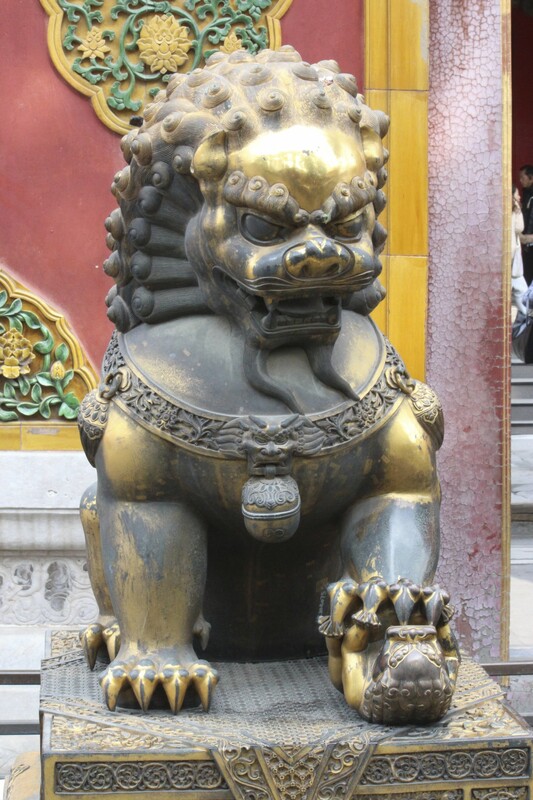 The entrance to the living quarter and almost all buildings had two brass lions out front. Crystal explained to us that the female lion is always on the right side of the door as you exit. You can tell it’s a female as under her left paw is a young tiger, laying upside down in a playful position. The male lion is always on the left as you walk out of the door. 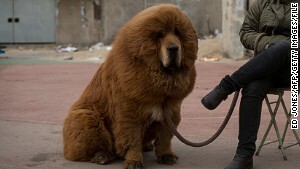 The male has a ball under his paw symbolizing supremacy over the world. The Great Wall. Who came up with that name? I guess because I’ve worked in the marketing world for most of my career, I tend to think about the process for how things come about. What was the thinking behind a product? Who is it for? What is the benefit? What was the thinking behind the name? And who in a room full of advertising people, thought that ad was a good idea? I just can’t help myself. As we made our way from Beijing, heading about 60 miles northeast, on our way to one of the wonders of the world my mind started racing about The Great Wall of China. Crystal, our guide, gave us a brief history explaining that it began as several individual walls for different states and became the Great Wall during the Qin Dynasty. Emperor Qin Shi Huang, the first emperor of China (220-206 BC) had the walls joined together to fend off the Huns in the north. So there was the thinking behind the product, the why and the benefit. Crystal shared with us some interesting facts like hundreds of thousands, if not millions of workers died while building the Wall. Some refer to it as the world’s largest cemetery as the deceased were just buried into the Wall by co-workers and the construction continued. Now that’s a tough work environment. 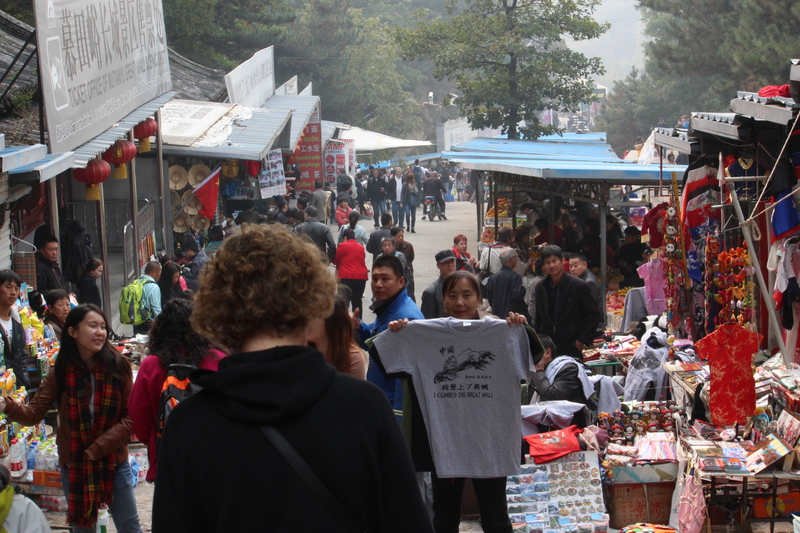 We arrived at the parking lot and made our way through a street of vendors selling everything from fruits, incense, Mongolian warrior hats and t-shirts with Obama’s face inset into the popular Chairman Mao image. The vendors are aggressive in their selling approach. They call you out “lady, lady” and if you don’t respond they come right up in front of you until you address them with a nod or a wave of the hand. I guess I stood out as a foreign tourist needing a hat in the shape of panda bear. We hiked up to the top of a steep hill to purchase our ticket for the gondola ride to the Wall. 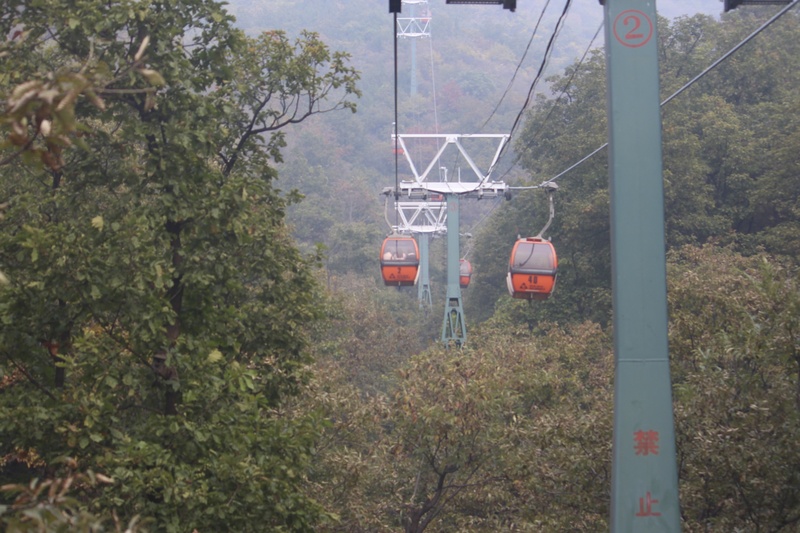 The gondola ride is really quite beautiful if you can keep your mind off the fact that you are dangling by a single cable over an incredibly steep mountain and that you actually hate rides and as an adult, cried at the anticipation of the drop on Splash Mountain at Disneyland. The pollution was incredibly bad the day we visited. 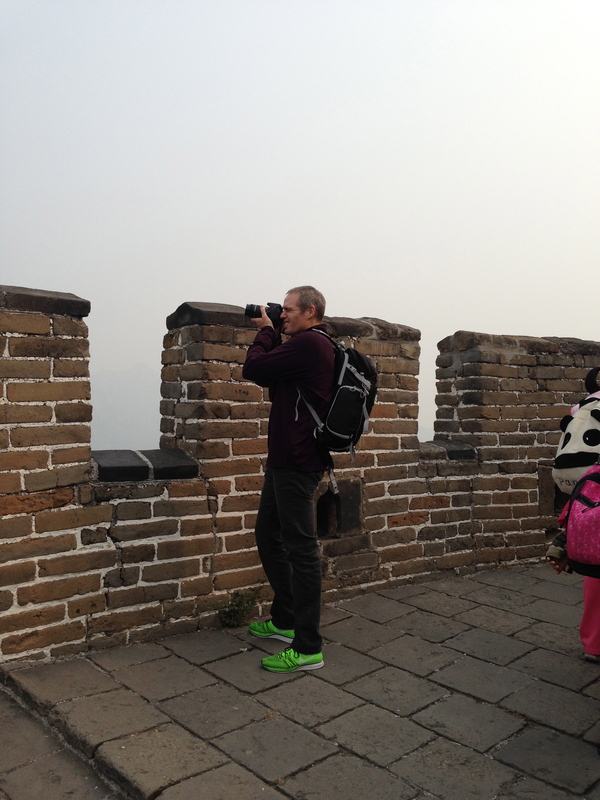 The air quality index was showing a rating of 317, listed as extremely hazardous with a warning to stay inside – but hey, it’s The Great Wall. As we made our way to the top, Crystal continued to share facts. The wall is just over 5000 miles long and of course, sections of it have been remodeled or reconstructed over the years. 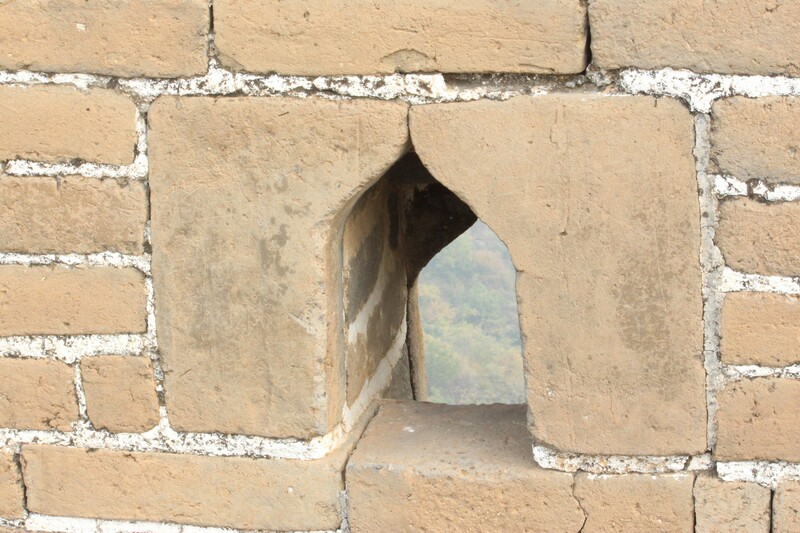 Aside from Mutianyu, the section we were visiting, there are 2 other areas of the wall that are open to the public. 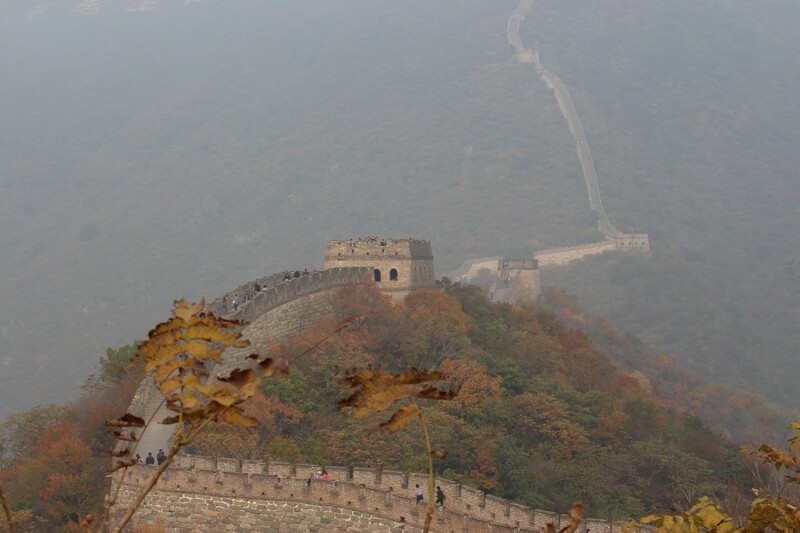 Crystal shared with us that the Wall on the China side is known as the inner wall, the side to Mongolia is known as the outer wall. It’s incredible to hear and see the thinking behind the architecture and to see the engineering that went into construction. 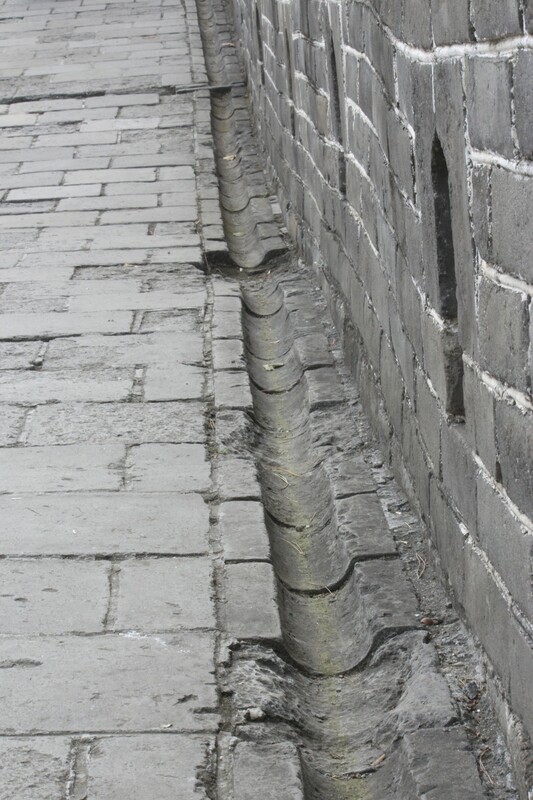 We learned that the Wall was built with an ever so slight slope with a “gutter” running along the inner side so that the rain would drain to the China side where the villagers would collect the water. Brilliant. We also learned that the cutouts seen along the wall were designed at an angle so the soldiers could look down onto Mongolia and shoot arrows through with no chance they would be seen or fired upon. Genius. We walked for about an hour on The Wall. The images are really deceiving as the terrain is incredibly steep. The stones are uneven and steps are made for small feet. Greg and I were taken by the “greatness” of it all. The Wall could be seen for miles. The craftsmanship and the attention to detail were incredible. A guiding principle for marketing is to evoke emotion with the name, the look and the feel of a brand. I guess that’s what Emperor Qin and his marketing team had in mind when they came up with the name, The Great Wall. 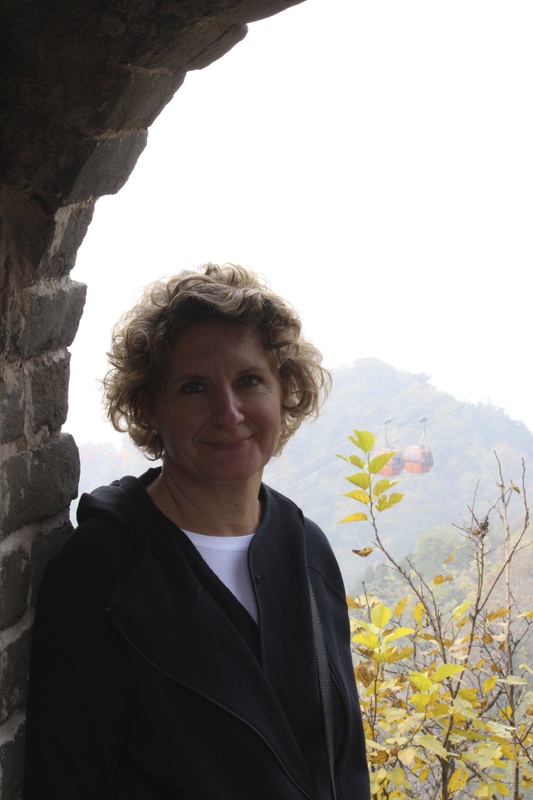 This weekend, we traveled about 90 minutes outside of Shanghai to Suzhou – Sue Joe to be helpful. Suzhou just happens to be a sister city of Portland. Kenny picked us up and was excited to share that he had downloaded some of his favorite American music for us to listen to on our drive. We drove through the crowded highways of China listening to Michael Jackson, Mariah Carey and Whitney Houston. Did I mention karaoke is big here in China? I asked Kenny if Suzhou was a big city and he dismissed it with a shrug and a strong no. When looking into facts around Suzhou I found that the population is just over 4 million. Nothing, I guess, to someone who is born and raised Shanghainese. Suzhou was originally founded in 514 BC during the Sui Dynasty. Let’s do a quick sidebar on the history of Dynasties in China. There have been 3 periods of Dynasty rule in China – Ancient, Imperial and Modern. 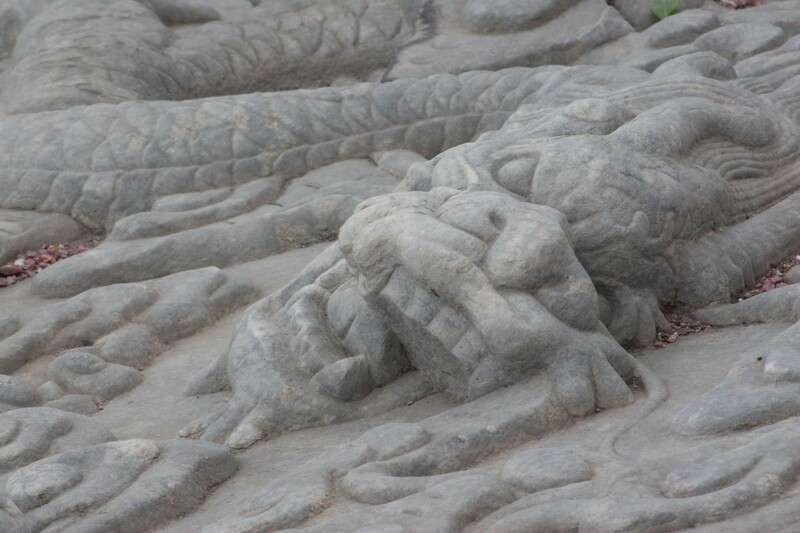 Within the Ancient period there was Xia, Shang and Zhou. Imperial was not quite as organized and there were numerous Dynasties and through disagreements and battles was sometimes split into Dynasties governing over separate territories. But more recently within the Imperial period, Yuan (1271-1368), Ming (1368-1644) and Qing (1644-1911) Dynasties implemented some organization and key decisions in history and culture were made. The Modern Dynasty, the one we are in now, has had 2 – Republic of China (1912-1949) and People’s Republic of China (1949 – present). Interesting to note, it is Chinese tradition that each new Dynasty writes the history of the Dynasty that preceded. It’s a good thing the U.S. government and the era of each new presidencies hasn’t caught on to this practice. Any who, Suzhou was founded during the Imperial era, during one of the split Dynasties of North and South. It was the commercial hub for China before Shanghai. Many of the building’s architecture and gardens are original or have been rebuilt after battles to reflect the original era. We visited the Zhuozheng Yuan or the Humble Administrator’s Garden, a garden dating back to the Ming Dynasty. According to Kenny and Wikipedia, it is the most famous garden in all of China. This garden, by the way, is the one that is the inspiration for the Lan Su Chinese Garden in Portland. Lan Su was built by visiting artisans from Suzhou. Go visit when you’re in Portland. It must be beautiful this time of year. After touring the garden we went to Xuanmiao Guan temple or The Temple of Mystery. This Taoist temple is located in the center of the city. First founded in the Ancient Dynasty era (AD 276) it was destroyed by wars and rebuilt in 1174. There are two entrances to the temple – the Gate of Good Luck to the east and the Gate of Fulfilled Wishes to the west. We made sure to enter thru Good Luck and exit thru Fulfilled Wishes. A true sign of the Modern Era ruling is the McDonalds and KFC located just outside the gates of the temple – I like to think of that exit as the Gate of Obesity and Digestive Issues. Our last visit was to the Silk Factory and Museum of Suzhou. Suzhou is known as the most premium in the manufacturing of Silk. The factory was fascinating and walked you through the production from silkworm to finished products. It was a bit like visiting Graceland, now stay with me, like Graceland in that, you are moved by the history and process and then disappointed when at the end of your guided tour you are dumped into a store to buy memorabilia, trinkets and trash. I wonder if Graceland and Ancient China have ever been compared before? It was a beautiful fall day and it was great to take a drive, sing along with Man in the Mirror and visit the Sister City of our hometown. For the past few years, my kids have been calling me out whenever I complain about something they deem as trivial. They quickly make the statement “sounds like a first world pain, mom.” After the call out and spending just a second on my complaint, I tend to agree. I have since started calling others out as a defense and a way to make myself feel superior and not so much like a whiny, spoiled American. This move to China has forced me to rethink my complaining. What happens when you have legitimate complaints in a 2nd world country? 3rd world if you run China through the filter of suppression of news and media but that’s all I’m going to say about that as I don’t want this blog shut down. So what about my complaints? Could they be legit for a 2nd world country? The answer came to me as I was discussing “China Days” with a co-worker and he asked me if I was familiar with Maslow’s Hierarchy. A study from the 1940’s that suggests that within each person is a hierarchy of needs and the individual must satisfy each level before they move onto the next. There are five levels. We discussed and joked that when you left the U.S. you were at the top of the pyramid. You were living a life that satisfied each level and now that you’re in China you are starting at the bottom and need to rebuild. Not so easy living here. Every day you are concerned about the safety of the water you drink. Where your food is coming from. Is your food really what they market it as. And each morning when you wake up, you check an app on your iPhone that tells you the air quality and if it’s safe to go outside. 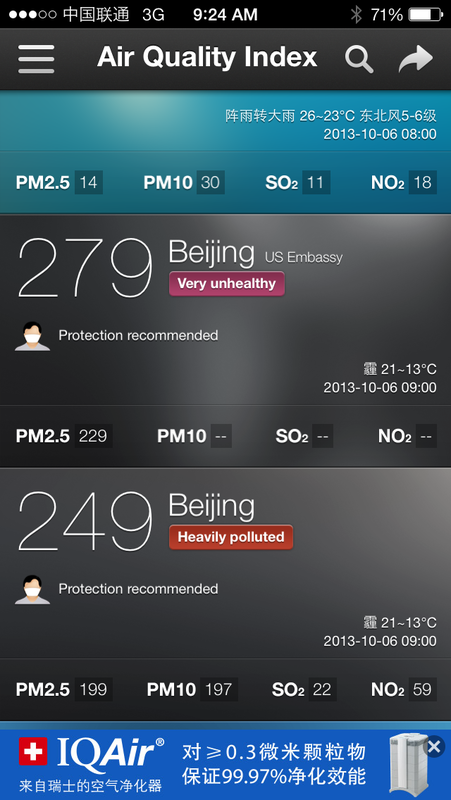 By the way, the top number is what the U.S. Consulate reports and the bottom is what China is reporting. We follow the top number. These are real and legitimate challenges of basic needs. Over the last six months, the people of Shanghai and China have been challenged with issues I never had to deal with while living the life of comfort at the top of the pyramid. Just take a look at a few headlines from this last year. Mar 11, 2013 – At least 2800 dead pigs have been fished from a Shanghai river since Friday, but authorities insist that tap water in the city is still safe to drink. I just couldn’t insert a photo. But if you’ve already clicked on the link above – sorry. The latest food scandal in China – which has seen rat meat passed off as lamb – has raised more questions about food safety in the country. No need for a photo here either. You get the idea. The above gave me nightmares for days. And then there’s this report. Who does this? China. In a country where everything is made and if it doesn’t exist, just ask and it will appear. They can make anything. So why not try this. The first week of October is known as The National Day Golden Week in China. It’s a 7-day national holiday really, but it’s called The National Day. Why it is not called The National Week, I don’t know. I’ve stopped trying to make sense of things. It hurts my head. It’s one of 2 weeks in the year that are considered national holidays, the other is Chinese Lunar New Year Golden Week which begins in January or February. It’s January or February due to the Chinese calendar – I think. We’ll figure that out later. The National Day holiday, implemented by the government for the People’s Republic of China began in 1999, so no long history or great storytelling. Unless you consider the primary reasons for The National Day holiday. It was put in play to help expand tourism within China and improve the national standard of living – oh, and as if only a side note, the 7 day holiday allows people to travel home to visit their families. Last year the government reported that 86 million people travelled by road, 7.6 million traveled by air, 60.9 million travelled by railway. 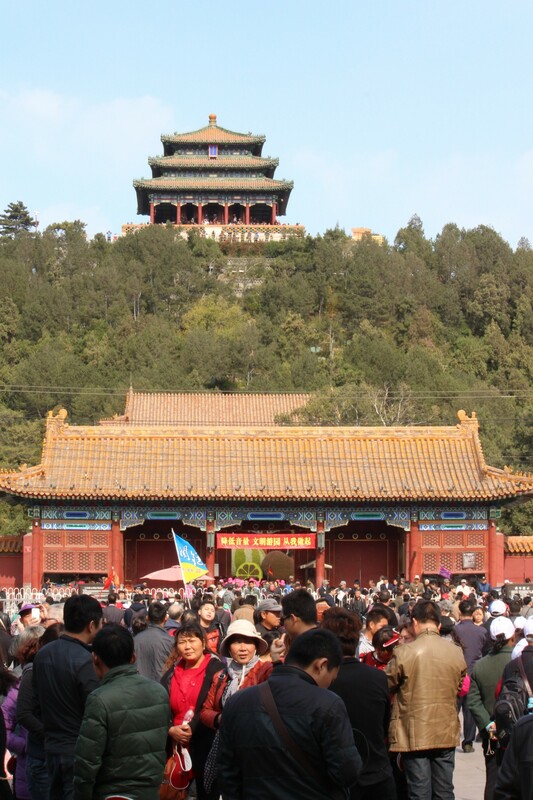 The Forbidden City located in Beijing set a new record of 182 thousand visitors in one day. Not to be too insulting, but Disneyland closes the gate at 75 thousand. Moving people and crowd management seem to be a strength of the Chinese. For the retail industry, this is a huge week for discounts and sales. Everybody has sales. Everything is on sale and everyone is shopping. 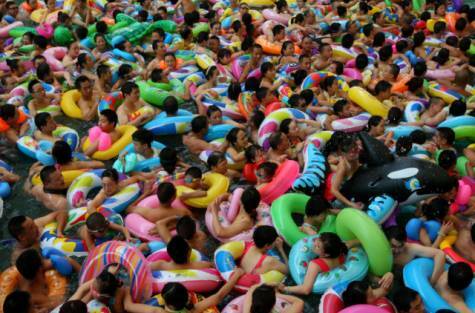 It’s China’s version of the U.S. Black Friday and Thanksgiving weekend. The first week of October is also my birthday week, so this whole week off from work and celebrations sits well with Lu Si. I’m new here but next year, I hope to be the head of the dragon in The National Day parade. Last night Kenny picked us up to take us out to celebrate. On the way, he handed me a beautifully wrapped gift. 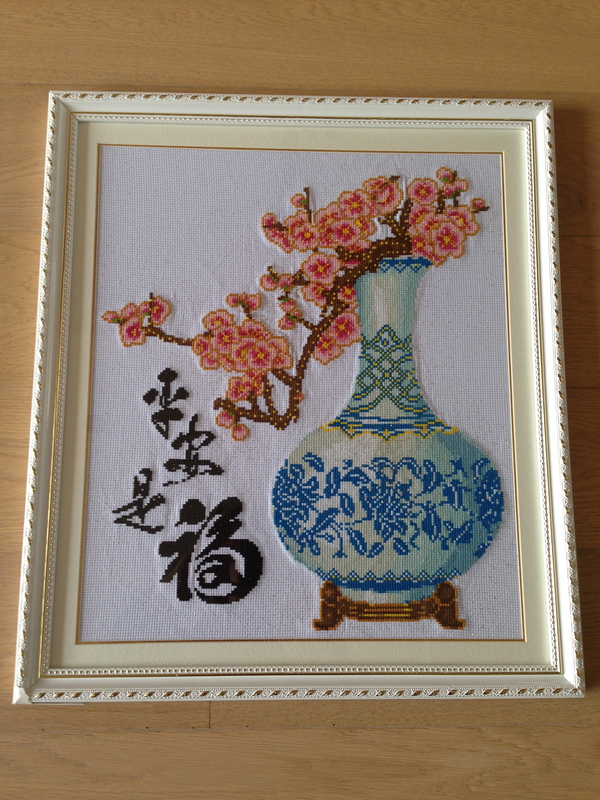 One of his friends, cross stitched a piece of art with the saying “Peace is a blessing” done in Chinese characters. I ❤ Kenny. Greg took me to dinner at Mr. & Mrs. Bund on The Bund. A delicious dinner followed by a night-cap on the balcony to witness The National Holiday Golden Week and a night time view of The Bund. I hope you enjoy the photos and please make note of the crowd of tourists enjoying the views and the boats along the Huangpu River with a million of their closest friends.